pard and Jean Simmons, "The Spirit is Willing," starring Sid Caesar and Vera Miles and "Who's Afraid of Virginia Woolf?" starring Elizabeth Taylor and Richard Burton. In an advertisement, Cascade Utilities, known today as Reliance Connects, encouraged everyone to call their mothers. 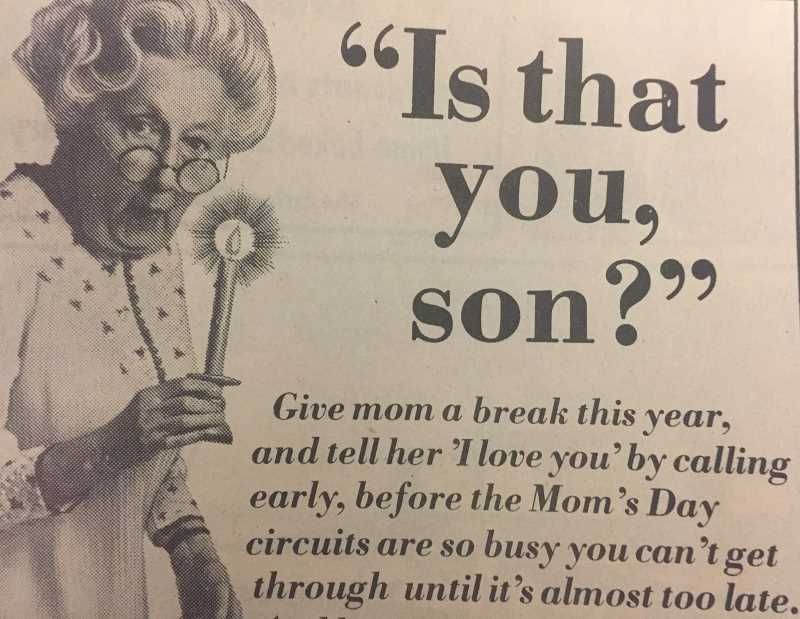 "Give mom a break this year, and tell her 'I love you' by calling early before the Mom's Day circuits are so busy you can't get through until it's almost too late," the ad encouraged. "Call mom early. She'll love it!" The "Elwood News" section updated readers of the happenings in that area. "The Friendship Bible coffee was attended by 14 ladies on April 27 at the home of Mrs. Lester Spencer. The lesson was from the Book of John," The News reported. Meanwhile, "Mr. and Mrs. Otho Barket drove to Silverton Sunday, April 30, and visited and had dinner with Mr. and Mrs. Del Stevens. Mrs. Stevens and Otho are cousins." Estacada School District Superintendent Scott Clark and News Publisher Bill James praised Estacada High School sophomore Jenny Beaudoin for her efforts with the school's Hycada newspaper. Beaudoin worked on the newspaper at the office of the Clackamas County News (predecessor to the Estacada News). "I find myself engrossed in reading your numerous articles in each issue. You have great talent. Thank you for sharing it with our district," Clark wrote in a note to Beaudoin. James added that Beaudoin had "never missed a deadline, but that is only because she's willing to give 110 percent of herself. We've seen her here at the CCN office as late as midnight and as early as 6 a.m. We've seen her on weekends and before or after a date. Rarely is a person of Jenny's age so passionate about something as multifaceted and demanding as a newspaper." Estacada High School Vice Principal Seth Johnson would soon be principal of River Mill Elementary School, succeeding Tina Rhue. "I grew up in a household of educators," Johnson said. "I've always enjoyed the school atmosphere, working with students and helping others learn. I guess education has always been part of my life. . .I'm really excited about being the principal at River Mill where so many positive and exciting things are happening." Boating enthusiasts recently gathered for the annual Upper Clackamas Whitewater Festival near Carter Bridge in the Mt. Hood National Forest. The weekend featured a series of races and events for kayakers, rafters and paddle boarders. Luke Spencer, one of the event's organizers, enjoys connecting with a variety of people at the festival each year. "It's not a race with elitists," he said. "Sometimes kayaking has that mentality, but we don't have that here."